Description: Rendered in Bryce 7.1 Pro (given that DAZ have been giving Bryce 7.1 Pro away for free I hope everyone who can has taken advantage of their generosity) if not goto http://www.bryce-tutorials.info/ and follow the "get started" link. Since Bryce 7.1 Pro is so far in advance of earlier versions it is worth getting just to update your old Bryce 5 scenes if nothing else. Anyway, this scene is an anglipherized version of the second scene here http://www.daz3d.com/shop/bryce-pro-ibl-v-ta-landscapes/ rendered using True Ambience and Horo and mines, ALST+. Must be viewed with red/left and cyan/right 3D viewing glasses to make the image true 3D. Wish I had the darned glasses, keep forgetting to order them online. Really wish I could see this thing. Strange feeling blind in this way. Looks like it should be a very successful study from the unaided viewpoint. Hi Rashad - until you get them, you'll have to trust me on this, you cannot judge without the glasses. I've done over a hundred of these renders in the last month and that is what I've learned. They can look like they are going to work without the glasses and you put the glasses on and something is wrong. Also the converse, you look at the distribution of the images and think - that's not going to make any sense - it can't it's all wrong, that foreground object has a background image and so on - and put on the glasses - and everything falls magically into place. And sometimes there is a surprise when you see things in 3D you view of the structure of the scene can change, scales become more apparent and also any "cheating" is shown up. I have only one question. Have you looked at the images through red/left cyan/right glasses? What I find is that those that have not, generally cannot answer this question in a straight forwards way. And those that have, don't question the need for 3D viewing. Wrong. No. Not that. Simply put. Have you looked at the images through red/left cyan/right 3D glasses? Please just yes or no. Then it is easy, I will know what to explain. Once again no. I did not say that. But because I have extraordinary patience and faith in my ability to ask exactly the right question from the outset. I will politely request an answer. Well for me art is, if that makes any sense, i have only been working with it in the digital format for a coulpe of years since i first found Bryce 5.5 for free,i can draw or paint anything by hand, it is the creation process that i find most enjoyable, creating somthing from nothing, being able to do it and seeing it with the 3D glass's i find to be extremly cool and if you can find a market for it and make a buck or two , thats a bonus and i think this scene looks great, Got a release date yet ? Thank you Stephen, well the fact of the matter is that is was Horo that has driven the interest in this anaglyph project, while I have been content to tinker with the mechanics of the process. But bit by bit I have grown more interested in the imagery itself because it offers such an insight into my old Bryce 5 scenes. I have had a great deal of fun going back and re-rendering them as anaglyphs - it has been a bit of an eye-opener in terms of reviewing what works and what does not. The "flat" renders let you get away with much more. True 3D rendering is far more punishing. But also, in a way, more rewarding. It seems a shame now to make a scene in 3D to turn it into 2D and not feel you can grasp the objects - some float out of the screen, others are a window into another dimension. At first the viewing is hard, but I have found with some practice, it is not as difficult as it was at first. The mind seems to accommodate to the coloured glasses after a few minutes it seems. I don't know. Maybe it is not the same for everyone. I can't really do the cross-eyed viewing images at all, yet Horo can. Others cannot use the coloured glasses. Still yet some people will not even try them. So anyway, enough rambling. This product (now months in the making) is presently in the hands of DAZ's QA department. If anyone buys it, that would be nice, but it's been the most fun to make of all so far. So even if it does not attract much interest it has still been worth doing for us. Thanks for clarifying, David. Like Waleed I need to get the glasses. Your question to him is simple but I wonder how his translator handles it. It probably cannot translate anything using a hyphen which might be why he isn't getting your simple point.I will try to see if I can explain to him what you mean. Thank you Rashad for that suggestion. I had not considered that something so simple should stand in the way. Yes do pick up some glasses and we will have a new artistic dimension to contemplate. Not only is there depth, but also the degree of depth. And not only scale, but do you want the scene to be apparently tiny, or normal sized, or oversized. It can be fun making big scenes that look small, like the canyon, in this 3D land it looks like a model, but the depth is enhanced. Or alternatively with a different tool setting, it could look vast. To the eye without the glasses, though, both would look almost the same, a muddle of split and over layered channels. Hello, David! I was just passing by when I got across yours and Horo's anaglyph images. What a trip that was to walk through when I dug-up my red/cyan glasses. I should to shake the hands of both of you. You tirelessly striving to broaden out the horizons of what can be done in Bryce. 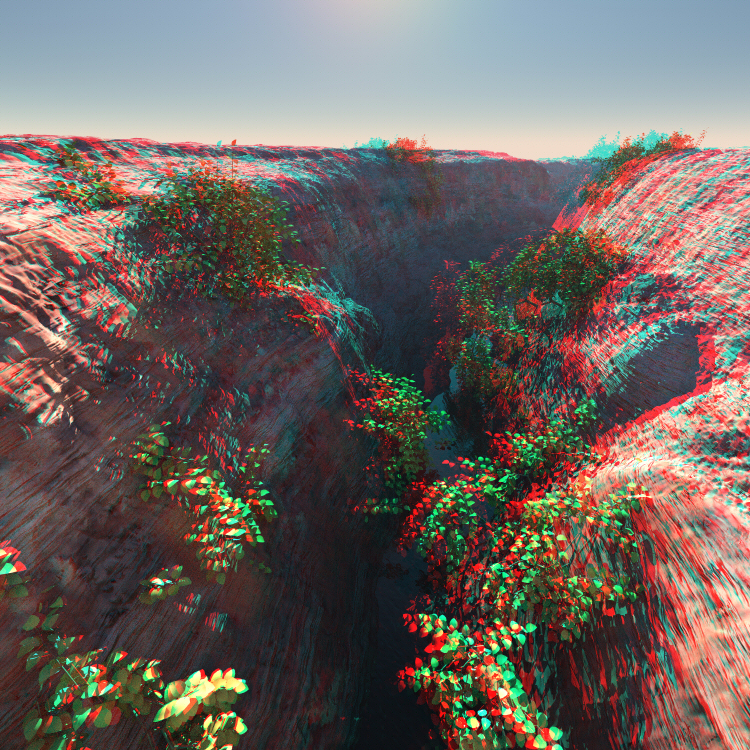 Just marvelous :) The anaglyph 3d also brought back some nice memories for me. I was going to stop here, but the above "discussion" tempted me to state an opinion on the matter so... Waleed. There was this one time I decided to share a thought or two about your entries and how they develop each time you post here. I gave you few pointers so hopefully you could improve the drawbacks of your images. Apparently none what I kindly said to you was noted, because the basic rules of lighting/shadows, texturing and even post-work actions did not change. Ever. It's all the same in every image. Believe me, I wouldn't have taken the time to explain if I knew you were to say "thanks" and do the same. Now I read above your way of having conversation and I stumble upon that "25 years of expertise", perhaps you meant experience. You see, it's not enough to just tell the number of programs you used, people need to see results. And using powerful names such as Maya, Max and so on (VRay is a renderer by the way, not a 3d modeling and visualization package) has to come with some background experience and at least some basic knowledge how the 3d works. Especially for 25 years of... well, knowledge and practice. Forgive me if I don't believe that. And I don't mean to be rude, just straight forward since Bryce5.com is a place where people learn 3d (I started learning here as well) and opinions must be objective. Yet people are trying to do their best, not offending your artistic ego about the lack of proportion and size in-between your buildings and plants/trees, chosen location of human figures and vehicles, the lack of textures and unplausible lighting to liven-up all your renders, even night-time ones. I'm not even mentioning the postwork. Having that in mind I really don't see the point of throwing any number of unnecessary questions to David Brinnen, since the man clearly explained what is this Anaglyph 3d phenomenon standing for. He never tried to "prove" anything. Waleed, be thankful that he's willing to share what he knows and how he achieved it. "Where is the concepts", "Where is the basic of this theory" - oh please read the comments and buy yourself a red/cyan filtered glasses, and don't forget to look through them before involving the rest of the graphic designers world. As for "proving" - I respect artists that are trying hard to perfect their skills, learn from others and have something to show to the world, and not simply an image but a living and breathing Ideas of how the 3d can be the tool of an endless imagination. Now you try to prove and persuade me that you can create a complete and coherent 3d composition that is worth of having something to comment on. Thank you for your kind remarks Richter, always pleased to have you drop by and hear from you. Well, it is like this, while we were steering Horo and I did dream up a million and one things that we wanted Bryce to do and this was one of them. At first we thought, oh the programmers would have to be called upon. Then I started experimenting with some filters (we are working on sets of filters for the Bryce camera to add in special effects) and I was tinkering with this one lens system that allows isometric rendering... yeah, that is one weird lens! And a little light bulb went on under my thinking cap and it occurred to me that if it will turn the camera isometric I can move the virtual position of the camera to any position I have in space. Only I need a way to un-isometric the view. This is the trick, the anaglyph lens system is a sideways periscope. Anyway it has been great fun to turn my old renders into 3D and I'm pleased you like the results. I have despaired of those, and there are a few would you believe? Who insist that the images are no good and also, that they don't need glasses to tell me this. They can tell just by looking at them normally. Kind of missing the point to my way of thinking. But never mind. I'm pleased you dug up your glasses and recovered some nice memories! Mr. Karajah, you'll be surprised how many useful things I can do. Do you you know what the term "constructive criticism" means? Or is it something the Google translator cannot reveal to you. I have a ton of constructive criticism for you, but you don't need that. You think it's prohibited :) Please feel free to laugh all you want at my images. I put them online for many reasons, one of them is laughter. It's a real shame what you're saying.. something about me getting away from here...and seats. I didn't get the last one.. actually I did :) but I couldn't care less. Anyway, you would do good to reconsider that attitude of yours. It will get you nowhere. I have sent you an email explaining the removal of some of your posts. Let's discuss the issue in private and not in the forums. Thanks. To me the 3d art is almost a religion, this is not an overstatement. I care very much for detail and concept, I love the 3d art in its core and its roots in traditional arts and mathematical, mechanical and physics fundamentals; not a single render I ever produced was lacking detail and background concept and not once I refused to revise a render, tinker on it and make it better for all of us, to see and learn. I am generally a modest man, but take great pride at what I do. And when someone comes... without any trace of argument and starts degrading and leveling my hard work to the ground, and even has the god-forsaken impudence of calling me "hypocrite" without knowing a damn thing about me,.. trying to chase me out a place you never knew existed a couple of months ago... You, dear and respected... artist.. Waleed Karajah, how do you imagine the things from now on for you, do you think it can get any more personal than that? Do you feel the need to insult any further? I know exactly what I'm capable of creating, yes a "cube" and a "cylinder" makes no difference to me to start off with if I want to model a bathroom, a car, a house or an entire cityscape. And I am getting paid by professionals to do exactly that. Your insults, sorries and excuses I'm indifferent to. Now, even that faint glimpse of respect I had for you in the beginning is gone, and I can forget what you wrote, I can forget you. I know tempers are flared in this thread. The brunt of the storm is over fortunately. Its probably best not to fan the flames any further. Waleed and I have already communicated about this thread and the personal nature of the comments in private emails. Yesterday we came to a good understanding about what types of comments are most effective and which types of comments are not allowed. I explained to Waleed that we are all a family, and that we always treat one another with respect, even if we disagree on an issue. He says he understands that so hopefully we can move on. Everything should be more or less smooth from now on. All negative comments have been removed, and positive comments have remained. I think we can move on from this issue now.